It's been a long day. Not a bad day, mind you, just a long day. It started at 3:00am in the milk barn. Our DHIA technician was on hand to weigh our cows milk, and that monthly event generally adds about a half-hour extra time onto the milking shift. We finished up just before 6:30. By the way, preliminary results came back this afternoon and we had a herd average just shy of 59 pounds of milk per cow. 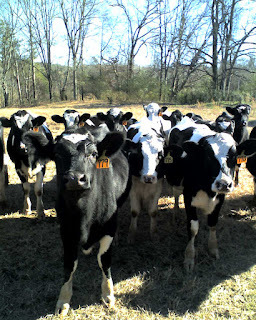 We should get the complete report sometime next week, and that's when I'll be able to post information about the cows in our "Edopt-a-Cow" program on our farm website. After breakfast, we spent a few minutes switching a few dry cows from one pasture to another, and then we begin building cross-fencing in one of the fields we'll graze our milking herd on this spring. We finished that job about 11:3o, and then had to herd three heifers back into their pasture. After lunch, I helped get things started in the milk barn, then went to find and fix the spot where the heifers had gotten out of their pasture. From that point on, it was a typical wintertime afternoon. We finished milking the cows and fed the calves and headed towards home a little after 4:00. I had to drink a couple of cups of coffee to stay awake and watch Florida defeat Oklahoma in the championship game tonight, so that's why I'm posting so late this evening. But the caffiene is starting to wear off and I've got another full day tomorrow, so it's time for this dairy farmer to hit the hay.